"We fundamentally believe that the readers should pay one price and get all or any of our content. If you don't pay, you don't get anything." — Neil Stiles, president of Variety Group. And so it begins. Newspapers, magazines, and broadcasters have more or less collectively decided that the time for consumers to pay for news and entertainment is 2010. The Good. When we covered the outcry for popular television shows like Veronica Mars and Jericho, fans of these shows overwhelmingly supported funding their favorite programs over leaving them to the fate of ratings or advertisers. Would it have been possible? Maybe, except broadcasters are likely to want consumers to purchase all the duds along with a few gems and watch advertisements too. Unless the price point is right, consumers won't do it. The Bad. That brings us to the bad. The average cable bill is about $85 per month, up 21 percent from two years ago, according to the Federal Communications Commission. Some people pay as much as $180 per month for the privilege of having access to more content than they can or want to consume. With Fox and others asking for more fees, those rates will likely climb higher whether consumers watch those channels or not. As prices rise, more consumers may opt out entirely, increasing the burden on subscribers who remain while reducing the size of a marketable audience. It seems likely that cable providers will eventually have to move to a pay-per-channel model rather than sacrifice their business. The same is happening with what used to be print. Consumers on tight budgets will narrow the number of content providers they are willing to pay for and that means plenty of content providers will disappear in 2010. The Ugly. And that brings us to the ugly. Not all content providers produce content worth reading or watching and, given a choice, consumers will skip them all together. Newsday, which was one of the first to move back to a paid subscription model, is steadily losing readers. At $5 per week, it's too much when other news sources are available. When cable operators are eventually forced to move to a pay-per-channel model, imagine what would happen when a content provider like CNN loses more than 30 percent of its audience like it did this year. A reduction in subscribers will mean a reduction in revenue. A 30 percent cut in one year may not be survivable. The Reality. I believe that content creators need to be compensated. They deserve to be. However, the reality is that most of them were too slow to develop a working advertiser-supported online model five years ago only because they wanted the best of both worlds — two distinct revenue streams, online and offline. And now, because that did not work out, they want consumers (and advertisers) to pay for the mistake. Meanwhile, there are an increasing number of free content providers — news, entertainment, analysis, advice, etc. — providing increasingly competitive content. And while they might not be multi-million dollar conglomerates, some will eventually give mainstream a run for their money, with a better value for advertisers as they reach more people with searchable content. "Good programing is expensive. It can no longer be supported solely by advertising revenues." — Rupert Murdoch, News Corp. Right on. Except nowadays, good programming is not enough. It has to be "better than" programming. Assuming consumers have a discretionary income of $100 per month for news and entertainment, that means they can afford approximately 10 to 20 channels/publishers at an average of $5 to $10 per piece in a tremendously competitive industry where local publishers/news outlets are competing with national publishers/news outlets as well as an abundance of free consumer-generated content, expert-generated content, and marketer-produced content. Hmmm ... good luck with that. Pay per channel seems so civilized an idea. With all the folks who missed the boat it makes you wonder if the situation wil not have something like a great flood effect wiping out most of what's out there. 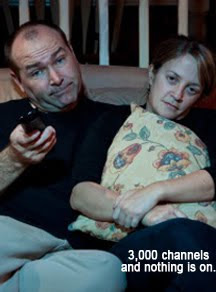 I think pay per channel will have to happen eventually. There are too many channels to continually raise the base rate, even if some are pennies on the program. We'll have to see what 2010 brings. It's hard to imagine all of these content providers sacrificing search engines (or irritating people who search, click, and are only given one paragraph), but some seem convinced that jumping off the cliff is the same as jumping to the other side. Ho hum. I like the flood analogy, because subscriber based content will wipe many of them out (and we'll all loose). After all, when I look at communication, I can build a list of 100 top communicators and hands down beat one paid subscription the same topic. The same can be said for business, politics, etc. What's left? Interviewees and advertisers tend to follow the numbers. Subscription charges diminish those unless you can consistently deliver programs and news content that ALWAYS outshines the competition. Based on one of the blogs we're working on right now — with 1,000 readers in three months — I would say that breaking through the pack isn't all the difficult, assuming someone knows what they are doing. Marketers can create their own audiences. Have a happy new year my friend!